My brother, sister, and I have kids. Buying gifts for kids plus siblings plus sibling-in-laws … it adds up with time, effort, and money. This year we decided on a new approach. We would buy real gifts for the kids, and then for each other … $5 gems. The goal was to buy the worst possible gift for $5. Before my wife and I moved from Houston to Colorado we were out with her folks one day. They had offered to buy us a dining room table, and we said, ‘yeah, ok.’ We probably said that more graciously, but who knows. While at a furniture store I quickly took to wandering because … it was a furniture store. I noticed none other than Mr. Quackers. A nice, wooden duck with clogs. How odd. I picked him up and did an old Bugs Bunny cartoon dance routine, having him dance around while I provided the music. My wife’s mom noticed this. Fast forward … some amount of time. Weeks? A month plus? It’s Christmas Day! Huzzah! It’s my wife’s family’s year and we are opening gifts. I’m slowly unwrapping this large gift, curious what it could be in such a large box, and whale … it’s … a duck? With shoes? What an odd, odd thing to get somebody. My wife’s mom has gone batty. What on earth? I mean, I know her family recognizes that I’m a weirdo but what a truly strange shot in the dark for a gift. You see, I had no memory of having Mr. Quackers get up and dance because I do dumb things every where I go, every day. If I had to remember all of the dumb things I do, my brain would be a complete waste of space. To me, the fact that I opened up a (to me, at the moment) totally random duck with shoes for Christmas is very funny to me, and it makes me appreciate Mr. Quackers and my wife’s folks all the more. 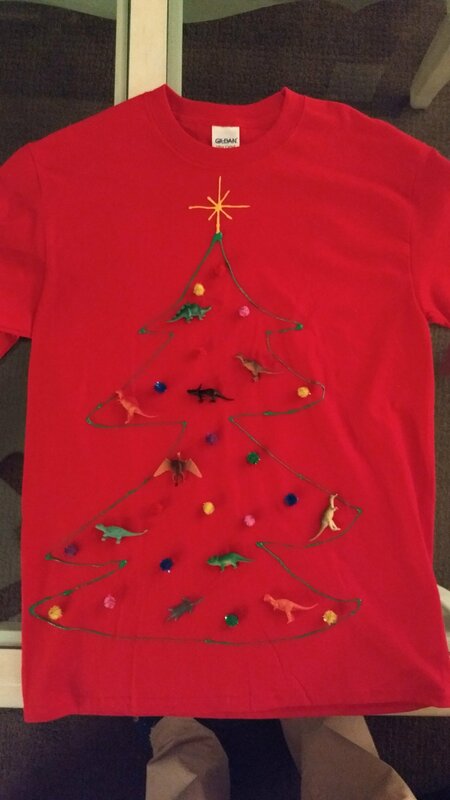 My wife suggested we make each other sweaters to wear on Christmas day. We settled for long sleeves from Hobby Lobby. 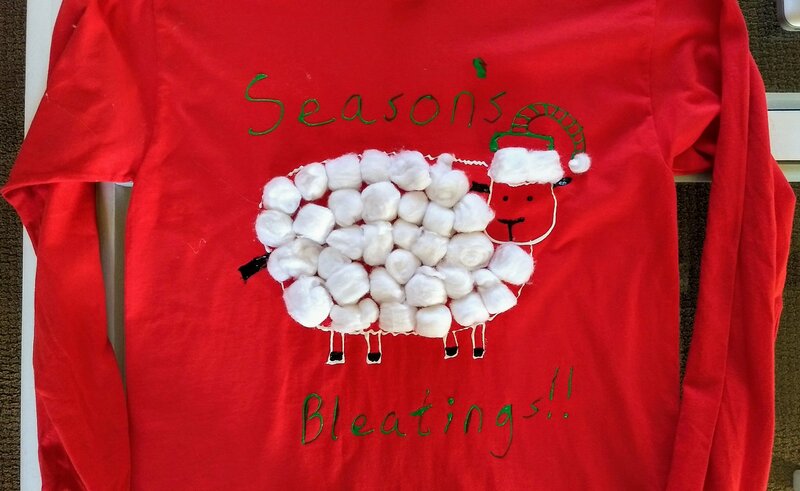 My sweater for her … Haven’t you heard of the famous Christmas sheep? From our little weird family to yours, Merry Christmas!! Christmas is fast approaching and you’ve got some of your shopping done but you’re still missing gifts for a few people. And wouldn’t you know it, they’re the people who are the most difficult to buy for. Don’t worry. We here at DumbFunnery have scoured the internet, obtained access to your emails, stalked your social media posts and know an alarming amount about you and your family. Not as much as Google knows about you, or Facebook, but still an unsettling amount. Your Neighbor Who Did You That Big Favor and You’re Like, Do We Get Them Something? There you go, friends. Merry Christmas from us here at DumbFunnery.